Wishes That Make A Difference! Edmonton, Alberta: We all have dreams and wishes. For many kids who are diagnosed with a life-threatening illness, a wish can enhance the quality of life for these courageous children and their families. 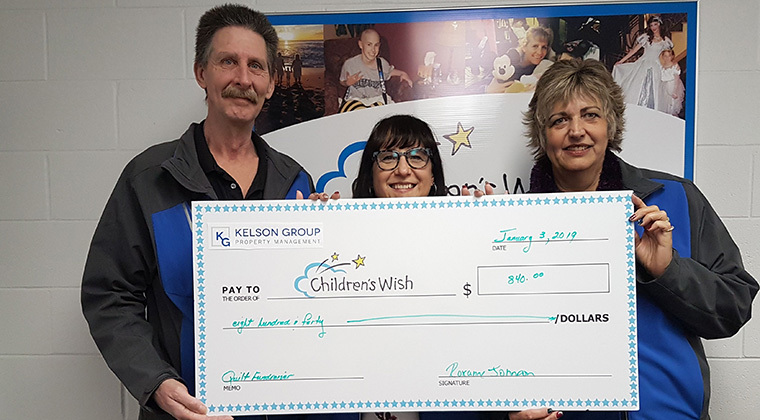 This holiday season, the Alberta division of Kelson Group was able to present a meaningful gift of $840 to the Children's Wish Foundation of Canada, and it all started with a lot of love and effort of a Building Manager in Leduc. "I've crocheted for years," says Sharon Perron, who along with her husband Kip, is an on-site Building Manager at Sunronita House, a Kelson Group apartment in Leduc. "This year, I wanted to crochet two throws in time for our staff Christmas party so we could do a group fundraiser, giving the funds raised to a worthy charitable organization." Sharon crocheted two beautiful throws, one a rich burgundy and white throw, the other a sumptuous blue and white one with the Kelson Group logo artfully crocheted in the pattern. Tickets were sold at the Christmas party as a raffle-style draw, and the group raised $420. "We were thrilled to see our team support Sharon's efforts by participating," said Roxanne Johnson, Property Manager for the Alberta Kelson Group portfolio. "Our team was equally pleased when our Vice President of Operations, Jason Fawcett, said the company would match any dollars we raised. We raised $840 to donate to the Children's Wish Foundation and it was a special way to start the new year by presenting the organization with the dollars raised." Children's Wish Foundation of Canada is the largest and only all-Canadian wish granting charity dedicated to granting wishes to Canadian children between the ages of 3 and 17 who are diagnosed with a life-threatening illness. To Alberta and Northwest Territories Development Coordinator Roxann Vaos, this special gift goes a long way in the wonderful work the charitable organization does. "There is a certain magic in learning that a group of people has decided to help grant wishes without even being asked," says Roxann Vaos. 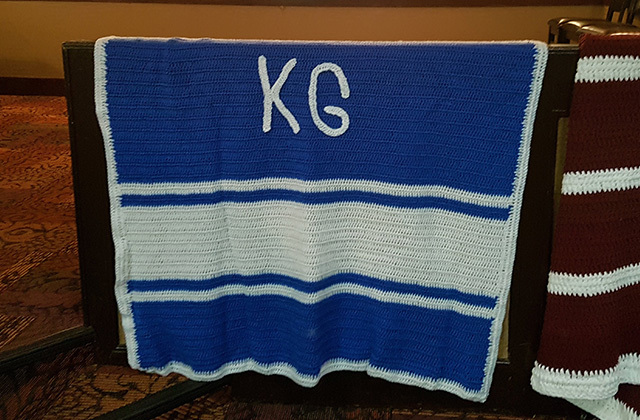 "When Kip called to tell us that his wife, Sharon, had crocheted two special pieces and they were used for a raffle to raise money for Children's Wish, it was a wonderful surprise. And, that Kelson Group matched the funds they raised says so much about the ethos of the company. We are deeply grateful. " Kelson Group, a company that provides apartments to help residents live better, feels that enriching the lives of kids with a serious diagnosis is a worthwhile endeavour. "I'm so happy that a small idea turned into something so great for our team to come together to support," said Sharon. "It warms the heart to have the backing of the entire team to help and I'm so grateful!"